Another month has finished, so it’s time for my favourites! 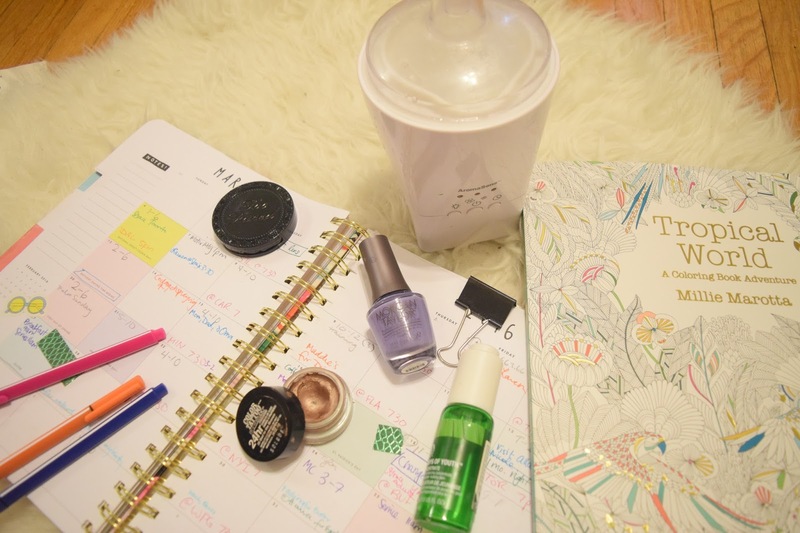 Keep reading to find out what I put on my face, ate, and did during March. I don’t change up my products that frequently (since I don’t have that many) but I’m definitely feeling the spring vibes with these ones! Too Faced Chocolate Soleil Matte Bronzer – I got this bronzer in a LuxeBox a while ago, and haven’t stopped loving it since then. I love that it smells like chocolate, but it also blends really well into my face. The colour is really good for me, it doesn’t look muddy or anything, and contours well. Smashbox Photo Finish Hydrating Foundation Primer – I’ve loved this primer for the whole year that I’ve been using it. Paired with their long-wearing foundation it feels very silicon-y, but recently I’ve just been wearing BB cream and this keeps it put even during a workout. Joe Fresh Matte Sheer Tint – I featured this in last month’s favourites as well, but I couldn’t help myself. I often work out before my shift at the gym, so I don’t want to bother with re-applying makeup: with the primer, this lasts really well, and isn’t too matte for my dry skin. Bausch & Lomb Bio True contact solution – When I first got my contacts in December, I went for the lens solution that had the most interesting packaging in Shoppers. Yup. Turns out I really like the product! I bought a small bottle at the start, and now I keep that one for when I’m travelling, and a big one for home use. I have pretty sensitive eyes but this works very well for me. Too Faced Chocolate Bar Palette – This is my only real palette for eye shadows (I have Naked Basics and a Clinique quad) and I don’t feel the need to buy another (although the Loreal Nudes and the Nyx palettes look so cute for their price!) which is great considering how many Beauty YouTubers I watch. It’s such a great collection of colours, and there are so many different combinations you can make. Morgan Taylor nail polish in “Eye Candy” – I received this in my Spring LuxeBox, and LOVE it. I got so many compliments on it all March, and am already sad that I put on a different colour for today. Ombrelle Face Ultra Fluid SPF 30 – You should wear sunscreen every day! This one is a great mattefying primer, too! The Body Shop Nutriganics Drops of Youth serum – This was one of those products I got tricked into buying when I needed another product to get stuff free at the store, and it turns out that it’s really good for me. Maybelline Colour Tattoo in “Bad to the Bronze” – My basic eye look is this eye shadow and maybe some eyeliner. Perfect. Nyx Butter Gloss in “Eclair” – I wasn’t sold on this colour when I first got it in an Ipsy bag a couple years ago (wait, is it expired by now? ), but now I love it. I absolutely love my agenda from Ban.do. The colours are gorgeous, the spaces are just right, and who doesn’t love their beautiful floral cover? 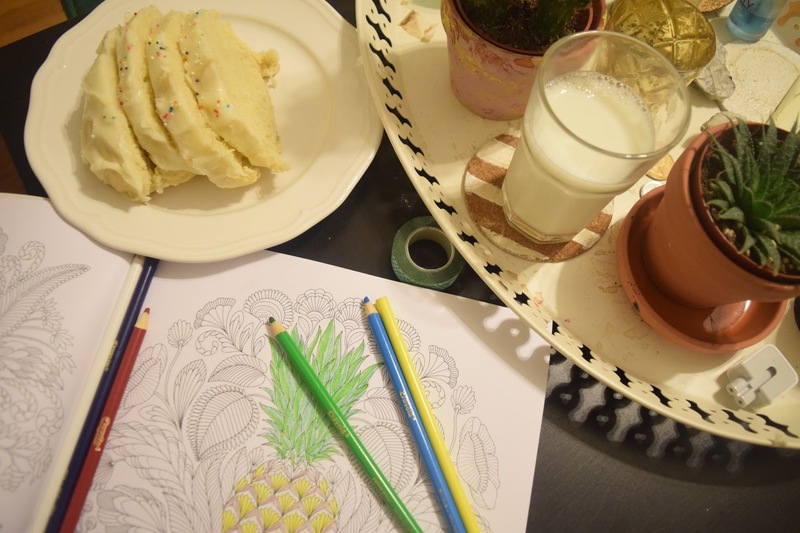 I also picked up “Tropical World: A Cloring Book Adventure” by Millie Marotta, which is a lot more fun than my previous colouring book, because I have lots of freedom with it. My Hubmar AromaSens Ultrasonic Aromatherapy Nebulizer is fantastic. Lots and lots of paska. What is paska? It’s a Russian Mennonite/Ukrainian Easter bread, it’s eggy and citrusy, and we put icing on it. Breakfast, lunch, dessert, pre-workout, it’s great for everything. Check out the recipe that Nic used, on Mennonite Girls Can Cook. 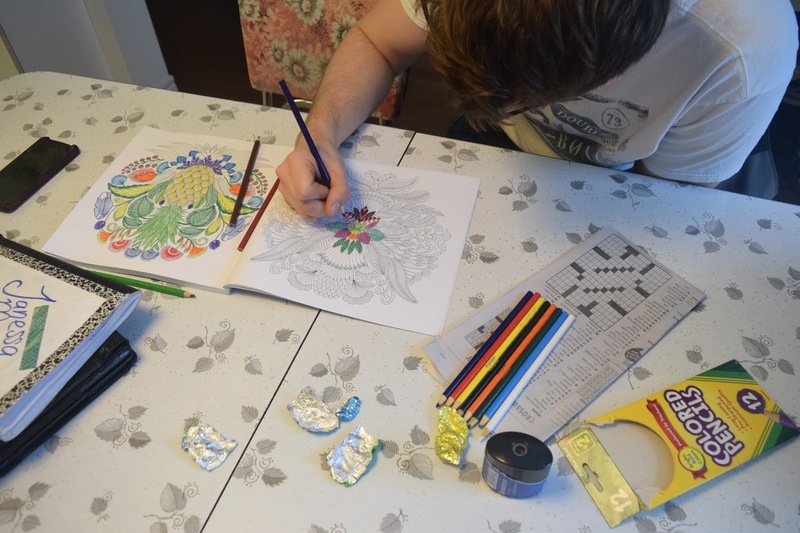 Like I said before, Nic and I have enjoyed using our new colouring book. It’s pretty fun to sit side-by-side and do it. 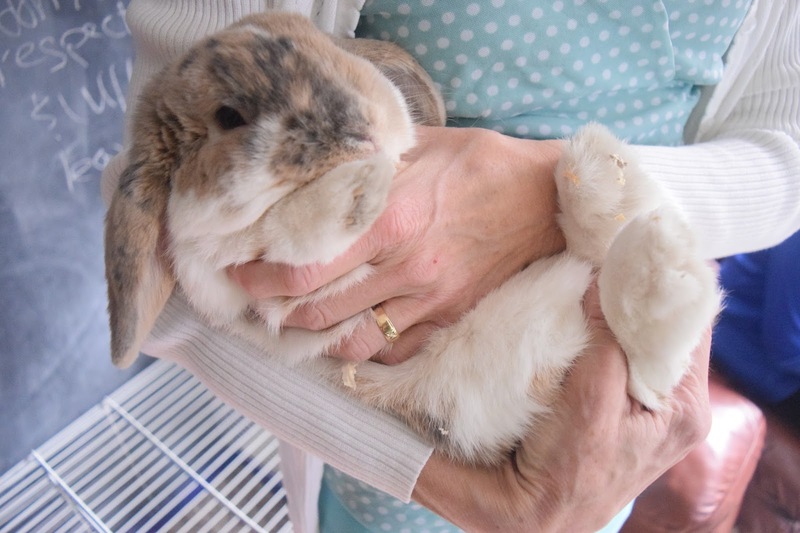 On Easter, one of the boys in youth brought his adorrrable bunny, Flopsy. Mom and I were so excited to hold her! 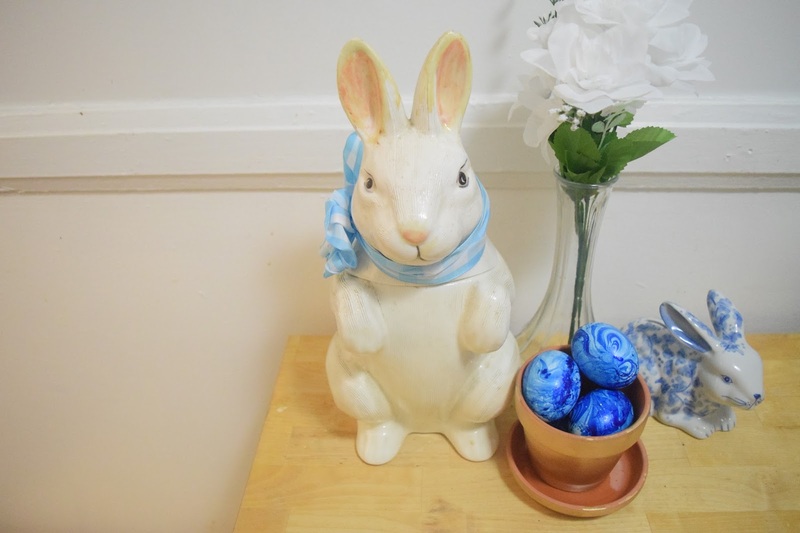 My favourite DIY of the month, these cool marble Easter eggs!